Aquatic silt curtains are a durable yet economic choice to control the settling of silt suspended in water, preventing these particles from spreading within the waterway. They allow the water to pass through while capturing the particles. 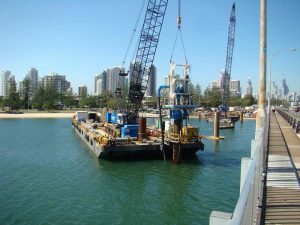 They are suited for use in dredging, excavation, piling operations, rock walling and other marine construction activities. 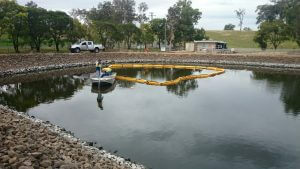 JJ Industries specialize in the supply and installation of aquatic silt curtains. With JJ Industries aquatic silt curtains you have the ability to create an effective curtain barrier and ensure a safe passage for marine animals to pass under the curtain. The main principle of a this product is to redirect the water towards the bottom of the ocean floor taking floating particles with it. They allow water to filtrate through the curtain cloth while filtering out the other elements. Water follows the path of least resistance. Consequently, when the water passes below the curtain, the hovering sediment is closer to the ocean floor. This causes it to fall out of suspension and settle to the ocean floor more rapidly. The principal design is to promote the settlement of particles without a large amount of disturbance to aquatic systems nearby. 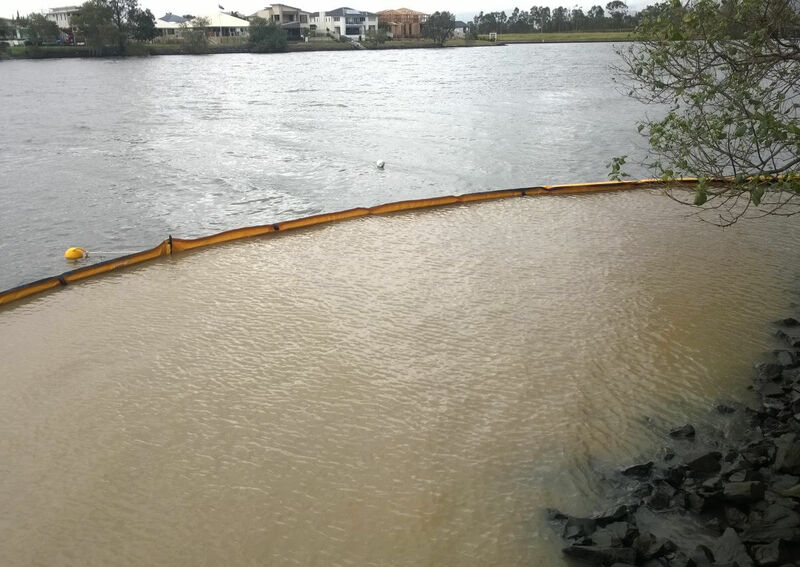 Silt usually migrates within the first 2 meters of the water column from surface disruption. 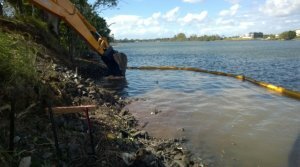 It’s imperative to control and settle the sediment so it has no impact on nearby aquatic systems. 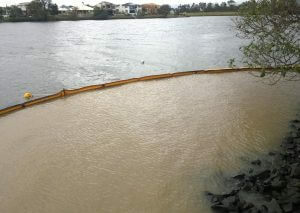 The Gold Coast City Council are committed to protecting our flora and fauna. The following penalties may apply if silt management is not a priority;From 1 July 2017, offenses under the Environmental Protection Act 1994 can attract on-the-spot fines from $1892 for an individual to $9461 for a corporation. Serious or repeat offenders may be prosecuted through the courts where the maximum penalty will be $567,675 for an individual or $2,838,375 for a corporation.If a site is operating under a development approval, a breach of development approval conditions may result in an on-the-spot fine of $2523 for an individual and $12,615 for a corporation under the Planning Act 2016. Higher penalties apply if offenders are prosecuted through the courts where the maximum penalty will be $567,675 for an individual and $2,838,375 for a corporation. With years of experience in the industry, JJ Industries are adept at supplying our clients with the correct product to suit their needs. 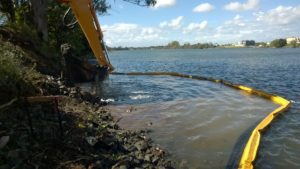 Before supplying our clients with silt curtains, JJ Industries take into account, wind speeds, water flow, traffic, tides, depth and anything else that will affect your product. JJ Industries have a range of products from short-term deployment to long-term deployment depending on your site requirements. 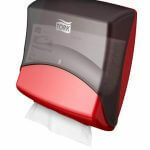 Class 1: Ideal for short-term use in calm water states. Class 2: Medium risk applications with modest wind and/or water forces such as rivers and calm harbors. Skirt depths up to 6m. Class 3: Suitable for harbor and open water sea states. Skirt depths up to 20m. JJ Industries also offer the design and supply of anchoring for your chosen product. In the past, JJ Industries have supplied a range of anchoring options; from a simple pre-formed concrete block to a fully engineered stainless steel anchor. JJ Industries offer all ranges of involvement in the supply of silt curtains, from the simple supply of a curtain to working with our clients from the design stage to installation & removal. 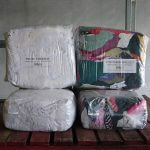 We have been shipping standard and custom products all over globe for more than a decade. 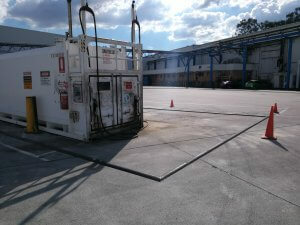 We have encountered numerous different, site, client and weather conditions. 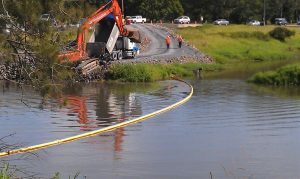 JJ Industries take pride in our knowledge and ability to assist our clients in all areas of their silt curtain needs. JJ Industries curtains are constructed using a 270gsm geotextile fabric but can be customized to site and customer requirements. The depth of silt curtain skirt is based on the information provided in the specifications and should take into account the fluctuation in tidal levels. Silt curtains (class 2) are connected using specially molded galvalised steel connectors to attach the float section of the curtain. These connectors provide strength and durability in the water. For offshore conditions, the option exists for heavy duty molded connectors to add strength. Heavy duty marine zipper is utilized to connect the lengths of the skirt which allows for identical sections of the curtain to be replaced if necessary. Bow shackles will be used to ensure the connection of curtains ballast chains. Our curtains are held in position by a galvanized chain along the length of the curtain. This ballast is sewn into a chain pocket at the base of the curtain during the manufacturing process. 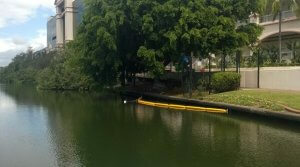 The projects shown below employed aquatic silt curtains as part or whole of the project. JJ Industries was approached by the Coffs Harbour City Council as part of tendering opportunity between us and 2 other companies. 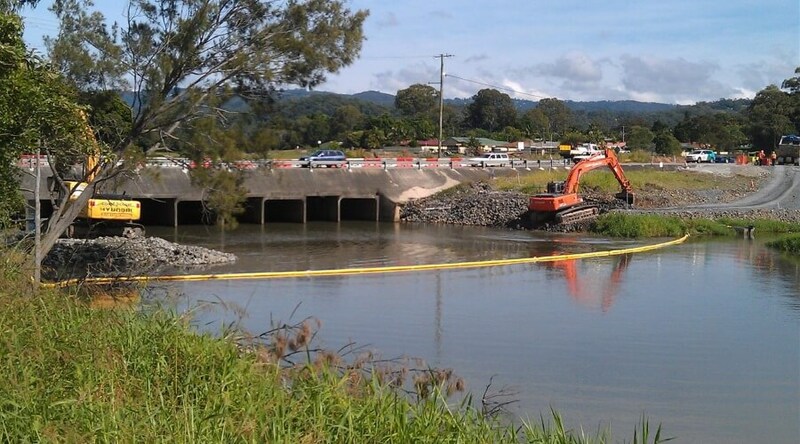 JJ Industries were contracted by Main Roads division Roadtek to design and supervise installation of aquatic sediment booms to prevent sediment and debris from bridge works escaping downstream. 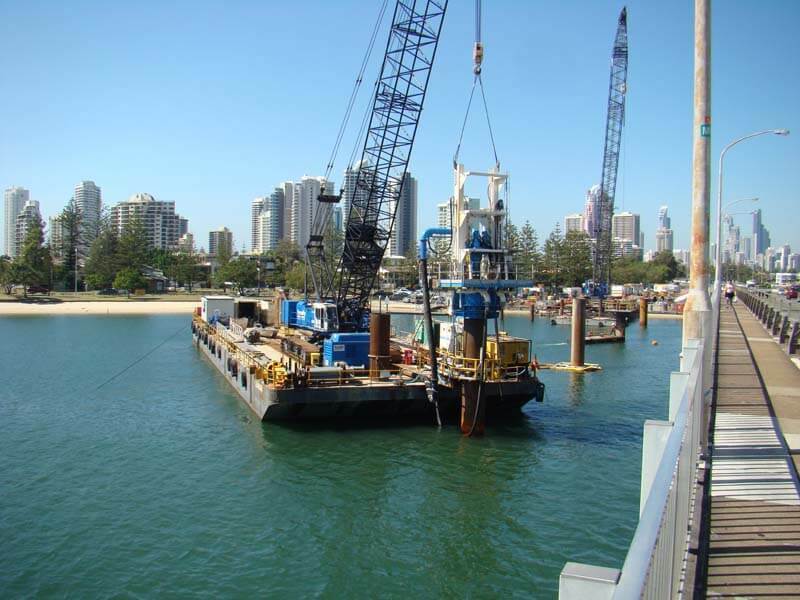 Silt curtain provided for Gold Coast City Council during construction of the light rail stage one. 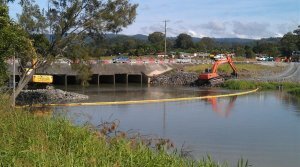 JJ Industries was contracted by a large scale Property development company to design and install a solution for controlling run off into the Coomera River during construction. 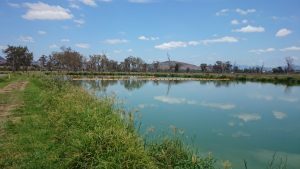 JJ Industries was contracted by Queensland Urban Utilities to supply and install a section of Silt and Sediment boom to act as a filter on the treatment ponds due to low levels of water. 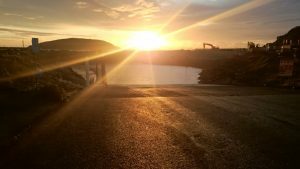 JJ Industries was contracted by Thomas and Coffey as lead subcontractor for the design, construction and installation of a static waste pond baffle system.